Most of history is told from a male's perspective. My intent of this blog is to show history from a different perspective, a woman's. These books that I am going to review are about women in historical eras. These are both nonfiction and fiction and can fit into any genre: historical, YA, mystery, fantasy, etc. It took me a week to create this blog. I would like to thank my parents for helping me and for their encouragement. I would also like to thank my friend and computer wiz, Allen, for putting this blog up on the website. Without his help, this blog would most likely not be up right now for I do not understand computer software. I greatly appreciate his availability and kindness to help me. Thanks! I greatly appreciate it! Love this blog, thank you for directing me to it! I love the setup and find it to be very educational. I will have to give a couple of theses books a read. Thank you. I'm glad that you like it! Synopsis:Travel through time with the touch of a hand. 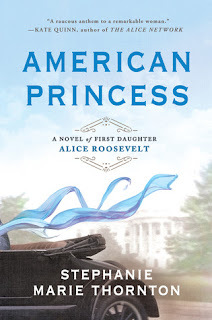 Synopsis: Alice may be the president's daughter, but she's nobody's darling. As bold as her signature color Alice Blue, the gum-chewing, cigarette-smoking, poker-playing First Daughter discovers that the only way for a woman to stand out in Washington is to make waves--oceans of them. With the canny sophistication of the savviest politician on the Hill, Alice uses her celebrity to her advantage, testing the limits of her power and the seductive thrill of political entanglements.